I’m writing this up now because TNT will start airing “Supernatural” from the beginning starting on Friday, and I’m as shocked as anyone when I say: This is a show you guys should watch. The short version is this: It made “Carry On, Wayward Son” by Kansas a thematically relevant song. But there are other (presumably better) reasons. Let’s see if I can explain how I came to love a show that, upon first hearing its premise, made me kind of want to punch the TV…. Grudgingly, I found I couldn’t avoid a show with that kind of description. So I watched TNT’s morning reruns, banging out four seasons in like three months. So I can tell you now with some authority, “Two brothers hunting monsters and demons in Middle America” is actually a pretty effective story-engine the writers can use for years before it wears out. And everything there is to like about it is actually right there in the pilot. The essential characters and conflicts of Sam and Dean Winchester, their monster-hunting mission statement, the simple but effective overarching plotline (their father essentially abandoning them to find the demon who killed their mother), a couple lingering mysteries, and the potential places the story could go if it ran long enough, are all sensibly built into the pilot. That doesn’t happen a lot. It’s even more rare that a pilot doesn’t lead to a disappointing series, or a fumbling second season, or all the other things that cause an audience to lose interest in a genre show. And then it’s off to the races, telling one of three stories: a straight-forward monster-hunting episode; a funny monster-hunting episode (you can spot them by titles like “Criss Angel is a Douchebag,” an episode with probably an FCC-recordbreaking number of utterances of “douchebag” on a network series; though every ep has a healthy sense of humor – again, a rarity), or a mythology-advancing show. If you spotted similarities to “The X-Files,” you’re on the mark. “Supernatural” has the same adherence to keeping the show’s essential premise at the forefront, while also crafting a larger story that’s straight-forward enough to avoid the convolutions and contradictions that ultimately brought “The X-Files” down. 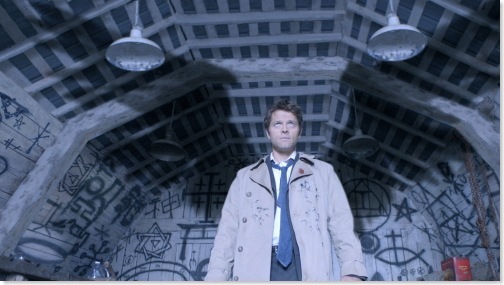 Which brings me back to “Carry On, My Wayward Son.” As the Rolling Stones’ “You Can’t Always Get What You Want” is a thematic touchstone for “House,” so is this Kansas rocker to “Supernatural,” as it plays at the end of each season (during the uber-recap, helpfully titled, “The Road So Far…”). The song’s lyrics are all about (in a prog-rocky kind of way) struggling past the horror and dreck of reality to see a bigger picture – only to learn the bigger picture could utterly destroy you. 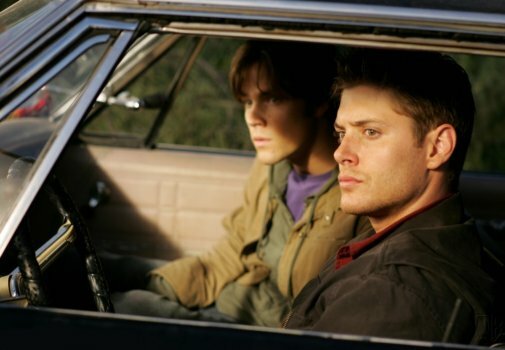 And Sam and Dean’s road, over the last five years, has been incredibly cruel to them. I mean really, REALLY harsh. Which almost always makes for great stories (except for that agonizing Buffy season 6). We’re talking soul-selling, trips to Hell, demon-blood addiction, massive survivor’s guilt, and the great capper that crystallized seasons 4 and 5: the possibility that God is out there – but he ain’t speaking to anyone. Not even the angels fighting in his name. If even the heavenly host doesn’t know what God is thinking, what possible hope do two boys from Kansas have? All that may make the series sound pompous or overly focused on quasi-religious mysticism. But the show stays true to the little things that initially made it charming and relatable, be it affection for middle-class reality (classic rock, long car rides, diners and motels), its willingness to ditch the uber-plot for an episode or two in favor of a fun one-off story (usually with a couple of quick, “Look, we don’t have any new leads on [insert apocalyptic danger here], let’s just do the damn job in front of us” lines of dialogue), or most importantly, its grounding in the relationship of two brothers who love each other, even when they don’t necessarily like each other or have the same goals. So here’s your mission: TNT is re-running season one in two-hour blocks, starting Friday morning at 10. Set your DVRs if you got ‘em, otherwise grab it on Netflix. If you don’t like the pilot even a little, then the series probably isn’t for you (it’s possible, but I think a few solid scares, a couple of belly-laughs and a couple of well-defined characters hooks most people, right?). If you do, plow through the first season (the main complaint is repetition, but find me a genre TV series that doesn’t hit “Freak of the Week” a bit too hard in its first year), and you’ll be surprised how quickly the show goes from something you pop on while you’re doing something else, to something you can’t wait to watch when you get home. Might have to fire up the old TiVo for this. Is there any truth to the claims I’ve heard that this show is kinda creepily misogynist? Like the vast majority of female characters are there to be victimized or killed? Are there any strong females who aren’t defined by that? I haven’t seen a single episode, so I don’t have an axe to grind, but I’ve seen this bubble up enough to be concerned. I suppose there’s a way of watching it where women don’t fare so well, but honestly – everybody who isn’t in the main cast is there to be victimized and killed. But the recurring female characters – Ruby, Anna, Ellen and Jo Harville, Bella, Pamela – are usually capable, confident, and smarter or more experienced than the boys. There are only two “Women in Refrigerators”-style victims-to-provide-motivation issues, which do happen in the pilot. Maybe this is what people point to. But I’d say it’s not a strong criticism.